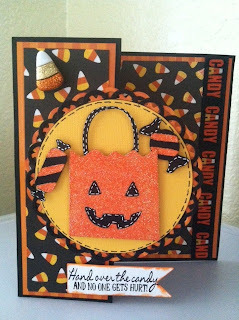 Craftin Desert Divas Blog: Pause Dream Enjoy Challenge #43: CANDY! I did one of my favorites an "S" fold card. I really took the candy theme to the max! 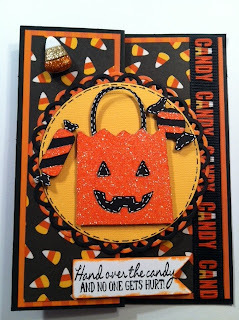 I used Create A Critter 2 cartridge for the bag and candy pieces. Added some Recollection glitter to give them a little sparkle. The paper is from Paper Studio Spooksville. The sentiment is my favorite it's from Scrappy Moms Bewitched sentiments. Hope you will have some fun and enter our candy challenge!! Remember to enter our $100. Joanns Card Giveaway!! I LOVE your card! This is just so,so cute - love the fold! And you totally rocked the CANDY theme - love, love, love! Such a fun and cute card. Love the pumpkin bag. Great stitching details. Like your use of Cricut cartidge. I have 1st version of Create a Critter cartridge. May have to put this on my Christmas wishlist. Like the sparkle. Not seen candy corn paper with black background and like it a lot. Great to be part of PDE DT. Have a wonderful Halloween and may you get lots of treats. What a wonderful card! So colorful and cute! Love it! This is such a cute "candy" card, great choice of the card fold. I really like the pumpkin bag! Such a cute card!! Love the paper! Tara I have something for you and April on my blog. Super cute (S) fold card. Love the sentiment !!! Thanks for joining us at LSP . Great card, love the papers & colours! Tara, I love your card! Thanks for joining us at Cut It Up! Super Duper Cute!Love the stitching! Cute card and love the S fold. Love that paper stack and that cartridge!! Thanks so much for playing along with us at Cut It Up Challenges!! Everything about your creation represents Halloween and makes it fun. Wonderful inspiration! 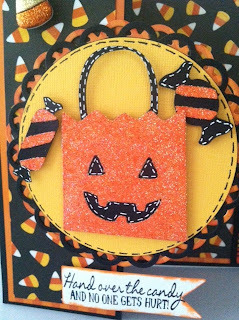 Thank you so much for playing in our Halloween challenge this week at 4 Crafty Chicks. Fabulous card the image is simply fun. Thanks for joining in on the fun at Tuesday Throwdown. We look forward to seeing you again. What a fabulous card!! Love all the glitter! !